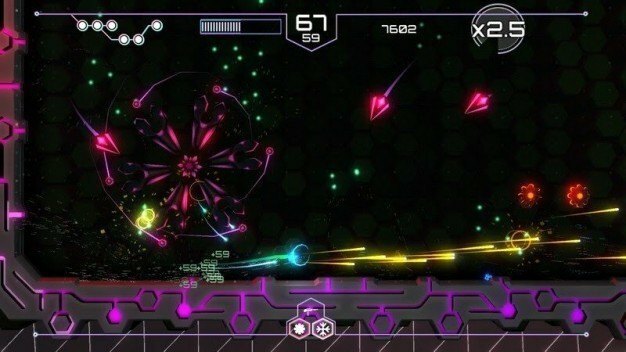 Tachyon Project, an action-packed dual-stick shooter originally released on Xbox One, PS4 and Steam, is now available on PS Vita. The game can be bought via the Playstation Store and is a cross-buy with the PS4 version, so anyone who owns the PS4 version already will automatically be given the option of downloading to their Vita for free. In Tachyon Project, you control a software program design called Ada to hack into the world’s most secure servers. Ada is happily hacking away when suddenly, after a series of mysterious events, she is thrown into the dark wilds of the internet. She will need to fight through 10 unique levels comprised of 6 progressively challenging waves of enemies in order to find out the truth surrounding her creator’s disappearance. As she progresses, her success will be rewarded with new weapons and perks which are essential to aid the player against increasingly difficult odds and much tougher enemies. 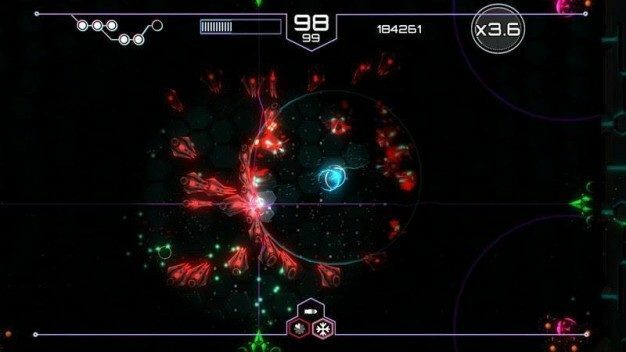 Tachyon Project has taken concepts from the classic shoot’em up genre and adapted them to make gameplay versatile and quick. Enemies display diversity not otherwise found in classic shoot’em up games, and players will have the option of fighting or sneaking right by in a brand new stealth game mode. Am I being stealthy yet? This game is story-driven and action-packed, offering 6 different weapons, 9 secondary weapons and 7 perks which provide hundreds of combinations for your ship. You will fight against over 30 enemy types (told you it was diverse!) and four nasty bosses. Story mode comprises of 60 different waves in 10 levels and offers innovative stealth gameplay levels and health system. Up to 4 players can compete with their friends in multiplayer challenges. However, if they prefer to fly solo, they can sink their teeth into an interesting story told through hand-drawn cutscenes which drive the gameplay forward. This is all brought together with an intense original soundtrack that players are sure to love. Dive in and help Ada out!